The average Easirent customer has their car for 3 days. So what can you do in three days? Run some errands, sure. Visit family, maybe. But even better, you could take a road trip! See as many sights as you can, stay in some great little B&B’s and get to explore the road and your car in-depth. It’s the mini-holiday you can take with friends or a partner and make memories for a fraction of the price. Take a look at our best picks of the UK’s Roadtrip Trails. Highlights: Arthur’s Seat, Queensferry crossing bridge, Stonehaven Harbour. When you think of a road trip you probably think of countries like Canada, New Zealand or Australia. All pretty great countries but pretty far away too. But there also is a little region in the North of Europe that is just as suitable for a road trip: Scotland! 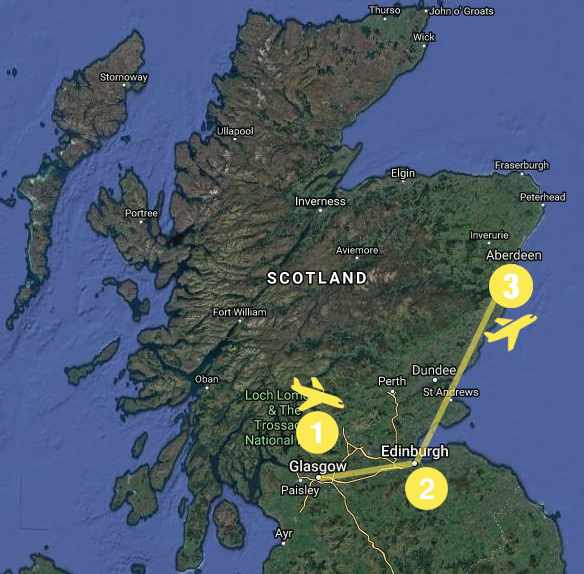 Scotland is not far away and has two big airports, one in Edinburgh and one in Glasgow. Thanks to airlines like EasyJet or Ryanair you can fly from Germany to Scotland and back for under 30 € and will be there in around 2 hours. And the best part: camping out in the wild is still permitted in Scotland! So just bring a tent and find yourself a secluded place where you can sleep out in the open. Alternatively, you can rent a little mobile home and drive from campsite to campsite. There are plenty of places where you can stay with your campervan on your tour of Scotland. The best part of a road trip through Scotland, however, is that you can experience so much in so little time! You can easily do an entire tour of Scotland in a week. If you have more time on your hands then you can do a trip to the Isle of Skye or all the way up North to Thurso. Day 1, collect your hire car from Easirent Glasgow Airport and explore Glasgow’s cool student neighbourhood. Around the university, you will find mostly old industrial areas with warehouses and huge manufacturing plants that are slowly being turned into really cool restaurants, bars and cafes to create an amazing atmosphere. Compared to Edinburgh, which will feel more like a quaint little sleepy town Glasgow feels almost cosmopolitan and pretty lively. After sampling the best coffee and delicious cake at any of the downtown coffee shops set off in your vehicle for Edinburgh via the M8 (the main motorway out of the city) or Edinburgh Rd (if you’re avoiding the highway). The journey usually only takes around an hour and ten minutes in good traffic so you shouldn’t need to stop along the way. If you take the M80 route then there are some well-rated camping spots along the way. Alternatively, you can stay in a B&B but we’d recommend waiting until you reach Edinburgh to stay somewhere a little more upmarket. Day 2, when you are in Edinburgh you should absolutely hike up Arthur’s Seat. Arthur’s Seat is a small mountain of volcanic origin and only 20 minutes away from the city center. Best to come early in the morning when it is not too full yet, or early evening and watch the sun set behind the city. You can either hike up to Arthur’s Seat’s peak which takes around 30 minutes or leaving Edinburgh you head left up the Salisbury Crags. This place is less run over and the view is just as good! Now, there are two routes to Aberdeen. If you want to be on the road as little as possible then obviously there is the M90 main motorway which still has some beautiful scenery and will take just under three hours. HOWEVER, if you want to truly road-trip in style and see some awesome sights, then we’d highly recommend taking the scenic route, up north through Stirling, Perth and Braemar on the winding Old Military Road. Day 3, along the way to Aberdeen you should definitely stop by Dunnottar Castle, these castle ruins are situated nicely on a protruding cliff right on the seaside. There are a number of nice beaches to visit along the coastal route to Aberdeen. Once in Aberdeen, you should walk to the so-called Castle Gate where you have Aberdeens Market Cross or you visit Marischal College and the King’s College Chapel of Aberdeen’s university. Once you have exhausted the city you can drop your car off at Easirent Aberdeen who will deliver you to the airport, ready to go home again! Highlights: Rosedale Abbey, Dalby Forest, Scarborough Beach. The North York Moors is one of the largest natural heather moorlands anywhere in the United Kingdom, but that’s not the only reason for its popularity… It is also a national park that spans more than 550 miles and encompasses Scarborough, Whitby, and Kirkbymoorside. As a result, it is a popular tourist attraction during the spring when the heather blooms turning the hillsides into a gorgeous blanket of purple. But for driving enthusiasts, the Yorkshire Moors may mean something altogether different, indeed. The drive from Kirkbymoorside to Malton to York is considered by many to be one of England’s best-kept secrets and English countryside tours. We’ll take you on a quaint countryside drive down from Newcastle into the moors, arriving at the seaside towns of Whitby and Scarborough then into York for exquisite shopping and eating. Finally ending up in Leeds. Day 1, collect your hire car from Easirent Newcastle Airport and head south to Middlesborough on the A19 stopping briefly at WWT Washington to get up close to rare and exotic birds in wetland habitats. Lunch in Middlesborough and a stroll around the Institute of Modern Art and Dorman Museum will set you up to continue on to your stopping destination of Scarborough. The drive through North Yorks is pretty picturesque as it sweeps up and down the moors, so charge your camera and pull over if you see a good place for a photograph! Past Whitby, Scarborough is full of sweet little B&Bs, where you’re bound to find a good deal on a nights’ stay and full English breakfast in this traditional seaside town. 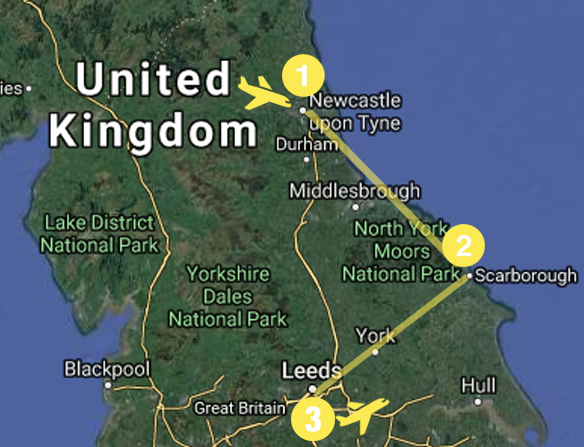 Day 2, leave Scarborough and set yourself on to the A64 – York is just a half-hour’s drive south from Malton, but it’s a scenic trip along the A64 that will take you through some very beautiful farmland. While you’re in York, try to visit the National Railway Museum, the York Castle Museum, the York Maze, the Holy Trinity Church, the York City Walls, and the Museum Gardens. The York Minster and the Merchant Adventurer’s Hall are also worthy additions to your itinerary. Meanwhile, if you want to experience the best shopping in York, head on over to the Coppergate, Swinegate, and Micklegate districts. You’ll pay a lot to spend the night in the city so we suggest finding a good camping spot further out. Yorkshire has vast fields and country valleys making for ideal camping spots, especially if you choose one on a farm that can provide fresh dairy, meat and bakery produce for self-catering trips. Day 3, on the way to finishing in Leeds you should definitely stop by Bramham Park, a Grade I listed 18th-century country house that is open to the public to walk the grounds and gardens. The routes through Yorkshire envelope you in captivating wild countryside with rolling hills and vast open vistas on either side. Roads that don’t have names or numbers throwback to a time where you can tell these were the only roads you could travel the country by. Once you hit Leeds, you’ll see the transformation to a thriving city of student bars and tasty burger joints. Then you can drop your car off at Easirent Leeds who will deliver you to the airport, ready to go home again! Highlights: Pennine Way, Monsal Dale, Lady Bower. Lying mainly in northern Derbyshire, the Peak District is one of the most picturesque locations in the British Isles and also graces small parts of Cheshire, Staffordshire and Yorkshire, covering a total of 555 square miles. The Peak District becoming the sustained beauty it is today is the result of the 1949 National Parks Act aimed to preserve and enhance such areas, with areas such as the Lake District, Dartmoor, Yorkshire Dales and Brecon Beacons all subsequently becoming national parks. Advantages of the Peak District becoming a national park are many, but one of the finest is undoubtedly the availability of its many magnificent roads. There is an overabundance of fantastic routes through this particular national park, but our favourite is through the gorgeous towns of Bakewell, Matlock, Buxton and Edale. Day 1, collect your hire car from Easirent Manchester Airport and stock up for the road as you head out on the A6 to Buxton, one of the most challenging and rewarding driving roads in the Peaks. There are a few places worth visiting along the route including Lyme Park, a mansion surrounded by wild Deer, Chatsworth House, ditto and Nottingham Castle, a historic castle museum and art gallery. There are literally dozens of great camping spots near the Peak District’s small towns. Or you can wait until you reach Nottingham for an impressive hotel stay at the Lace Market Hotel. Day 2, while in Nottingham, be sure to take in some historical tours and guides of the cities impressive architecture. The Old Market Square, the domed Neoclassical Council House, impressive guildhall and Nottingham Playhouse are all worth a visit. Another must-see here is the popular Galleries of Justice Museum in the city’s former court and jailhouse. In use since 1780, highlights of the museum include its courtrooms and a jail that dates from the 14th century, as well as fascinating exhibits relating to matters of crime and punishment (be sure to check out the displays about Robin Hood). Day 3, time to head off for more scenic driving along the River Trent. 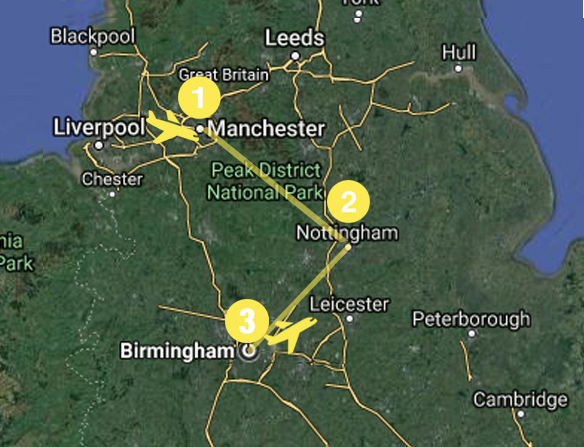 A popular route to Birmingham is avoiding the M1 to take the road through Derby and Burton-on-Trent. An interesting sight on the way is the Royal Crown factory in Derby, famous for its’ fine China products. In Burton, you can stop at the National Brewery Centre to discover the history, art and fun of brewing British Ale! Once you have arrived in the city you can drop your car off at Easirent Birmingham who will deliver you to the airport, ready to go home again! Highlights: Red Wharf Bay, Pen y Fan, Ruthin Castle. Taking you right through two of the most awe-inspiring national parks, Brecon Beacons and the Snowdonia Mountain range – this trip may be a lot of mileage but it’s totally worth it for the scenery along the Welsh coast. As Wales’ first National Park and the third most popular National Park in Britain, Snowdonia is something special. It stretches over 827 square miles full of unspoilt scenery with rocky mountains, clear blue lakes and thick forests. It has plants and insects you won’t find anywhere else in the world. And at the heart of it is the peak of Mount Snowdon, the highest mountain in Wales. 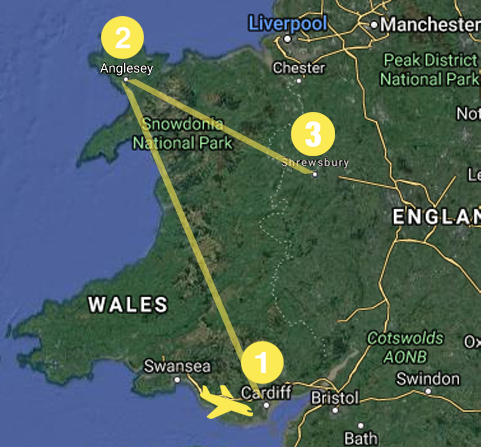 Day 2, from Snowdonia, we suggest driving north to the island of Anglesey. Forking left, the road dips near Portmeirion (famous for its’ Italian heritage and delightful tableware) through pretty Porthmadog and along mountainous countryside to our final destination, Anglesey itself. The only view many people will have had of this, the largest British isle outside Scotland is from the A55 on the way to Holyhead for the ferry to Dublin. However, there’s plenty to see and do away from that. Rather than the Britannia Bridge, take the Menai Suspension Bridge across the Menai Straights. Thomas Telford’s creation has taken traffic to and from the island since 1826 and is still a thing of function and imposing form. It’s then relatively straightforward to turn right onto the A545 all the way to Beaumaris. Historians consider this castle to be Edward I’s great unfinished masterpiece. Regarded by many as the finest of the Edwardian castles, it also has incredible views over the Menai Straights towards Snowdonia. By taking the B5109 and then turning right onto the A5025 you will get to Red Wharf Bay. If you arrive when the tide is in and lapping at the promenade, you’ll struggle to imagine the view when the water recedes, liberating nearly 10 square miles of sands. Day 3, the final day, once well rested – take the A5 out for the drive east. This takes you in the direction of Caernarfon on the main land and it’s worth a stop at the Anglesey Sea Zoo. Here you can buy hour-long rib rides which will increase your chances of seeing dolphins and sea lions in their natural habitats. Alternatively, there’s the Foel Farm Park with its petting zoo and pony rides and of course awe-inspiring view across the water to Caernarfon Castle. There are two routes now to take, either the rural A55 across the Northern coast or a more direct motorway through Llangollen. Then you’ll be crossing the border to Shrewsbury where you can drop your car off at Easirent Shrewsbury, however, the nearest airport is Birmingham for flying home again. Highlights: Monkey World, Old Sarum, Jane Austen Heritage Trail, Stonehenge. Drive the quiet, winding country lanes of the Dorset AONB (Area of Outstanding Natural Beauty). See hilltop earthworks, monuments, and tree clumps in a picturesque landscape that supports a range of habitats, and an unusually rich assortment of wildlife species. Stop at the oldest monument and walk in the footsteps of your Neolithic ancestors at Stonehenge – one of the wonders of the world and the best-known prehistoric monument in Europe. Explore the ancient landscape on foot and step inside the Neolithic Houses to discover the tools and objects of everyday Neolithic life. Day 1, collect your hire car from Easirent Exeter Airport and your route starts in a city known for its historic charm, heritage, and Gothic cathedral. Explore the underground passages, walk the Quayside, or browse the Royal Albert Memorial Museum. 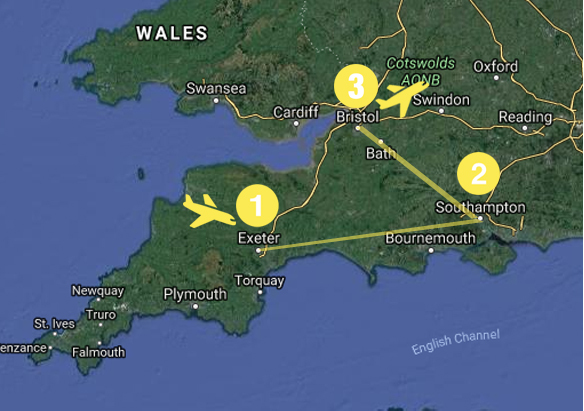 Day 2, next, our route moves to the coast, arriving in Bournemouth – the home of a long and inviting sandy beach with two piers and an art trail. If you’re here in the evening, Bournemouth has a popular nightlife with a diverse range of bars and clubs for all tastes. The journey now travels through the New Forest National Park which is filled with quaint villages and towns, as well as a myriad of nature walks and wildlife. With Georgian cottages, legends of dragons, witches, smugglers and a 1,000-year-old tree, the New Forest is bursting with things to explore. End the night in one of England’s historic ports, Southampton is a road trip ‘must’. A walk around the city to the old town walls and Bargate offers visitors a glimpse into Southampton’s medieval history and trading past (from wool to wine). Day 3, finish by heading north to Bristol. You’ll want to stop at the UNESCO World Heritage site city of Bath filled with 18th-century Georgian architecture, Roman Baths, natural spa heritage, and boutique shopping. It’s only a short drive to finish in the historic city filled with a range of things to see and do, from Brunel’s Clifton Suspension Bridge and Old City to Bristol Museum & Art Gallery and a Harbourside city walk. You can then drop your car off at Easirent Bristol who will deliver you to the airport, ready to go home again! 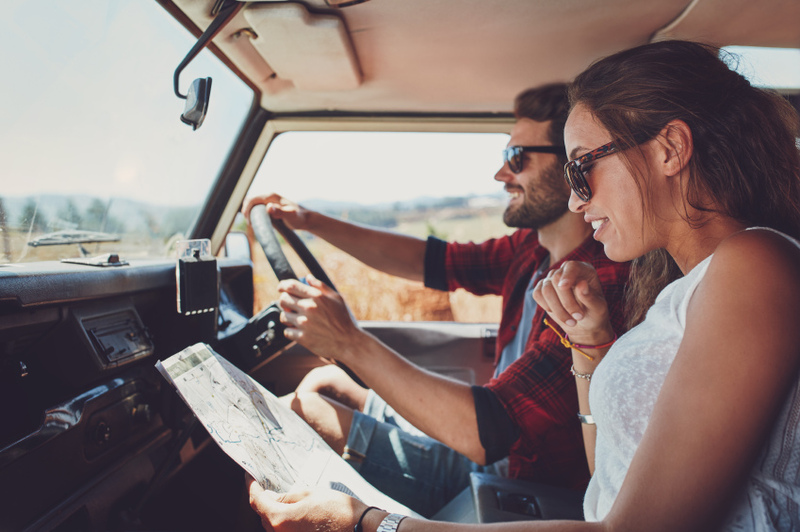 If you’re planning your own 3-day getaway and want Easirent’s travel tips, you can get in touch on Social Media by tweeting @easirentcarhire or find us on Facebook. Don’t forget to tag your Easirent adventure with the #DriveEASI hashtag. Happy Driving!